FIATA is recognised as representing the freight forwarding industry by many other governmental organisations, governmental authorities, private international organisations in the field of transport such as the International Chamber of Commerce (ICC), the International Air Transport Association (IATA), the International Union of Railways (UIC), the International Road Transport Union (IRU), the World Customs Organization (WCO), the World Trade Organization (WTO), etc. In summary FIATA is the largest non-governmental organisation in the field of transportation. Its influence is worldwide. TAFA : The Airfreight industry has played an important role in the economic development of Thailand for many years, especially with the export industry which has the active support of Government. Apart from airlines, one of the main companies in the forwarding business is the Airfreight Forwarder. The business operations can be divided into many different ways, for example, by plane, by truck and many other supporting services. Lack of discipline in operating those processes causes a lower-than-standard business competition. Cooperation and unity among those fellow forwarders is essential to maintain the honored status of the Association. The Association forms a neutral center which enforces rules and regulations and lifts the standard of services. 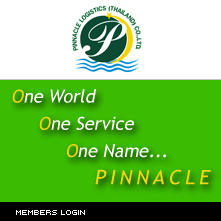 Additionally, the Association also acts as a representative for all the forwarders. It negotiates with other Government and Non-Government Organizations, endeavouring to create the best outcome for all concerned. TIFFA : Thai International Freight Forwarders Association is a group of international freight forwarders gathered together for benefit the entire sector. Advanced Professional Logistics Network (APLN) is the fastest growing global network for independent freight forwarders. APLN already has more than 500 members in almost 300 cities in more than 100 countries. APLN selects members that are willing to bring in their non reciprocal business to other members to help both build these trade lanes, which in turn benefits the whole group. All World Shipping is an independent US-based NVOCC associated with and available to WCA Family member companies. All World Shipping has China MoC-approved B/L and US FMC approved B/L for members to use. WCA Family operates five Member Support Centers worldwide: in Amsterdam, Bangkok, Miami, Mumbai and Shanghai.